Never Again, a new dramatic musical, is the story of Holocaust refugee Oscar and his 18-year-old son Ned, who gets hooked up with some neo-Nazis. When Oscar is invited to a 40-year reunion of refugees, he is forced to confront his relationship with his son and with the past that he’s denied for 40 years. The play takes place in a small college town, upstate New York. ACT ONE. Ned, an 18-year-old boy–a lost soul who can’t figure out whether to go to college, work, or what to do with his life–is asked to join a neo-Nazi group. His dad Oscar has been pressuring him to “get a life,” and now, excited with a prospect and a sense of meaning, he stops by his Oscar’s office to tell him the news. Oscar works for the College development office reselling buildings and dorms under new names and is about to resell the Beauregard Football Stadium, bought under that name in perpetuity in the 1920s, to the March family for 20 million dollars in total disregard of the earlier contract. Oscar is an Oswego refugee who came over at the age of 5 with his parents and brother from Europe in 1945, and whose mother committed suicide while still in the internment camp. He married in his twenties, had Ned, and after his first wife died, remarried Didi, a brassy but big-hearted travel agent. Hearing his son’s idea about the neo-Nazis, however, disorients Oscar, forcing him to question his long silence about his own past. When Oscar receives an invitation to an Oswego Reunion and Memorial Service for his mother, he decides to give up the Caribbean Cruise his wife has just won and instead take Ned to the reunion so that he can understand why he shouldn’t join the neo-Nazi group. While at the reunion, Oscar and Ned meet some former refugees, including Frank, a handyman who was once a doctor, and Zelda, a caterer who had been brought to Oswego as a girl. Ned, however, is much more interested in Claire, the 18-year-old granddaughter of Greta, a former nightclub singer who now works as a docent at a local Holocaust museum. Claire likes Ned too, until Eric, one of Ned’s neo-Nazi friends, shows up. ACT TWO. Didi is preparing for her Caribbean trip when she gets a call from Betty, the college PR agent, asking her to help locate the original stadium contract. A lawsuit that has been filed on the behalf of the Beauregard family, who are furious that their stadium is being renamed, and Betty needs the contract, which turns out to be in Oscar’s locked safe. Realizing that Oscar could lose his job, Didi decides to forego her trip and travels up to Oswego with Betty to get the safe key and to get Oscar home. Meanwhile, Ned realizes that he will have to choose between Claire and his neo-Nazi friends, who plan, with Ned’s help, to disrupt the Memorial Service. Ned hears more—the most moving—stories from Oswego by Zelda and Frank. Ned remains untouched by the stories, but is obviously moved when Oscar finally opens up and recalls how his mother escaped from the internment camp one night and was found dead on the banks of a nearby river, leaving his father to raise him and his baby brother alone. He decides to go to the Memorial Service, where he discovers a note from his grandmother, as well as her Jewish marriage contract, both kept by Oscar all these years. After a horrifying glimpse of Oscar’s concentration camp tattoo, Ned realizes that Eric has been lying to him and confronts his father about his own problems with the truth. Chastened, Oscar vows to call the March family to tell them to put their 20 million dollars to better use. He may lose his job, but he will not lose his self-respect or his respect for the past. This decision helps reconcile him to Ned, and to Didi, who by now has arrived with Betty. When Eric and his gang try breaking in, Ned punches Eric in the face, removing Claire’s remaining doubts about his character and intentions. She persuades him to “move on” by coming to work at her grandmother’s holocaust museum and working on his college applications for the next year. 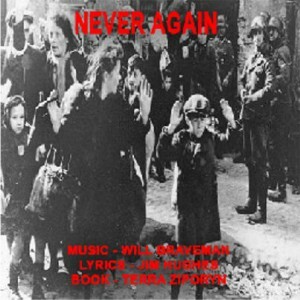 PLAY HISTORY: Never Again was developed at the Theatre Building Chicago’s Musical Theatre Workshop, where it had a staged reading in the fall of 2003.